This week I am writing from the great city of Dublin, Ireland, working out of one of our remote Tableau offices. Mainly hosting our awesome support team for our Tableau gurus in the European, Africa, and Middle East theatres. Although I am writing from Europe this week. I wanted to highlight a Viz from about my home country that discusses a topic that is on everyone's minds in any rapidly expanding country. How are people going to afford to live in these rapidly changing areas with costs constantly rising no matter where you go. 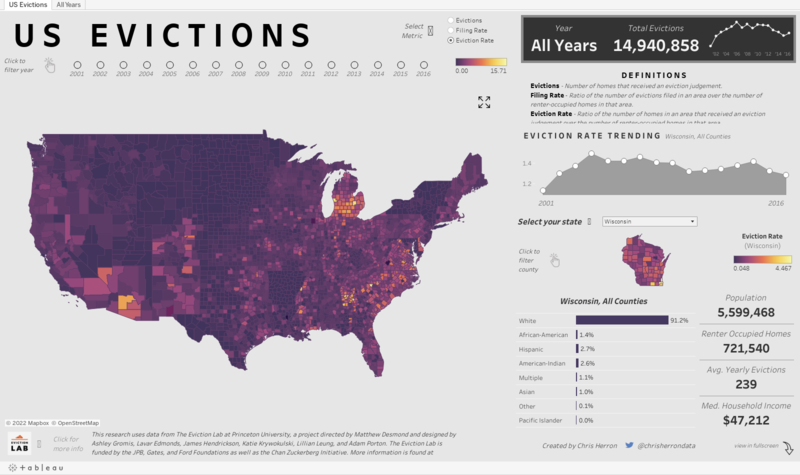 Chris Herron with help from The Eviction Lab created the Viz below that explores the evictions of US Households since 2001. Check out the rest of Chris' work and follo him on Tableau Public: Tableau Public| Chris Herron or follow him on Twitter, Chris Herron (@chrisherrondata) | Twitter . + Recognizing one awesome Tableau Community member to achieve the amazing achievement of the "Helpful is my middle name" badge in the Tableau Community. RAHUL SINGH was able to achieve this awesome badge this last week! Thanks for all your contributions Rahul they are greatly appreciated. + The most talked about thread for last week is Filling in select states on a map if no records exist in data source which received a whopping 28 replies in just a week time. Scott Kailey created the question and has been receiving some excellent help from Tim Dines and Mike Mainzer nearly creating a solution to satisfy the requirements of the Viz. + Our top voted idea this week was created by Alex Kerin back in 2012. Shading/Fill on background when None should be transparent with a total of 8 new votes it was the most voted idea last week. This idea is focused on the ability to set or modify the background color of a sheet in a dashboard.